If the cable channels are now offering three distinctly different perspectives on the race, that was much less so the case for the traditional three broadcast networks, ABC, CBS and NBC. To begin with, whatever strategic approach might be at play at its cable sibling, it is not reflected in the tone of the coverage on NBC, the company’s broadcast news operation. The data offer no hint of coverage being less favorable to Republicans, as seen on MSNBC. Actually, it was more favorable than the media generally toward both parties. News reports have suggested that the differences in editorial approach have created tensions inside NBC Television. Reportedly, some inside NBC News, including former anchor Tom Brokaw, were so concerned about the more ideological tone at MSNBC that shortly after the cable channel hired Air America star Rachel Maddow to become a prime time host, they persuaded MSNBC to no longer allow talk show hosts Chris Matthews and Keith Olbermann to anchor their election night coverage. But in the content studied both on NBC’s Nightly News with Brian Williams and the Today Show, there is a clear distinction between the broadcast and the cable content. Rather than being more negative toward Republicans than the media generally, as was the case on MSNBC, NBC’s coverage was more positive towards all candidates. This was most notable in the coverage of Sarah Palin. Fully 42% of the Palin stories studied were positive on NBC. That is substantially more than the press generally (28%) or on cable sibling MSNBC (21%). It is also more positive than we found on Fox News, which was the next most positive in its coverage of Palin. The differences are even more striking when looking at the negative coverage of Palin. 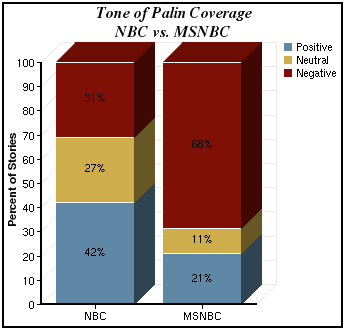 On NBC, 31% of Palin stories were negative, fewer than we found generally (39%) and far fewer than on MSNBC (68%). NBC also showed no unusual toughness on McCain. The coverage studied on NBC was similar to that of the press overall—slightly less negative (54% vs. 57%) and slightly more positive (17% positive vs. 14% in the press generally). But that stands in stark contrast to its cable sibling. In its treatment of Obama, we saw a similar pattern, typical of other broadcast network news, of being more positive and less negative than the press in general. NBC was both more positive than the press generally toward the Democrat (43% positive vs. 36%) and less negative (20% vs. 29% overall). But it was still somewhat tougher on the Democrat than MSNBC (where 43% of stories were positive but only 14% were negative). NBC was also somewhat more likely to frame stories around the horse race than others (64% of its stories vs. 53% for the press overall). In all this, NBC was not strikingly dissimilar to its broadcast rivals. There are some differences, but they appear to suggest differences story by story, not toward any ideological pattern or appeal. CBS News coverage of this race may be most remembered for the interviews between anchor Katie Couric and vice presidential candidate Sarah Palin, during which, by most accounts, Palin struggled with answers to some basic questions about policy and her record. The Couric interviews, an earlier PEJ report found, became a topic unto themselves in the rest of the media and were generally portrayed in a way that was unfavorable for Palin. Even Republican operatives and McCain aides tended in interviews to discount rather than defend Palin’s performance. But the data here also reveal some other distinguishing factors to CBS’s coverage. The most noticeable, looking at both the CBS Evening News and the Early Show, is that more of the stories studied on CBS were mixed or neutral in tone. In all, 44% of all the campaign stories studied on CBS had a mixed tone, in contrast with 33% in the press overall. ABC (at 30%) and NBC (32%) were more typical. That more neutral approach translated into fewer positive stories about all the candidates. It did not translate, to quite the same degree, into less negative coverage. In all, for instance, just 21% of the Obama stories were positive (vs. 36% in the press generally. Just 8% of McCain stories were positive (vs. 14% generally). But the percentage of negative stories about both candidates was more typical. It did translate into fewer stories of either a clearly negative or positive nature about Palin (21% positive for Palin vs. 28% generally and 32% negative vs. 39% overall). When it came to policy, 30% of all CBS stories were focused on that topic. That is markedly more than the press overall (20%) or than NBC (22%), and the same as rival ABC (30%). ABC News was the first journalism organization to get an interview with Sarah Palin. By the time the last debate had ended, ABC would be the network that offered the toughest coverage of the Republican vice presidential nominee as well. When it came to John McCain ABC’s coverage mirrored that of the press generally. But for Palin, more of its mix of stories proved negative than was true for either NBC or CBS. In all, 45% of its Plain stories were negative versus 30% on NBC and 31% of CBS (and 39% in the press overall). Given that it did somewhat fewer Palin stories, the actual number was similar to that on the other networks. When it came to Obama, the mix of stories on ABC’s Good Morning America and World News Tonight were more positive than the press overall (49% vs. 36%), on a par with NBC and higher than CBS (20%). Only a few other items stand out about ABC’s coverage, at least from the numbers. One is that more of its stories were framed as about policy (30%) than the press generally (20%) or than NBC (22%), and the same as CBS (30%). The bigger differences in network television were, as we have seen over the years in our studies, between morning and evening news programs, even on the same network. 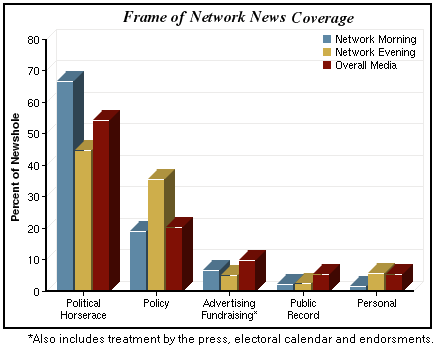 In the late general election phase of campaign 2008, the three morning news shows (Today on NBC, Good Morning America on ABC and the Early Show on CBS) were less focused on policy, more focused on horse race. They also tended to be more negative in their coverage of the candidates than we found at night—in that regard more similar to the media overall. The data, in other words, belie any idea people might have that these shows are softer or easier on politicians. In all, more than two-thirds of the coverage (67%) airing in the first half hour of the morning shows (the time period during which those programs most focused on traditional news) was focused on the horse race (who was ahead or behind, the tactics and strategy of the race). On the evening news, in contrast, that number was 45%, while the media overall fell in between with 53%. On the flip side, 19% of morning show coverage was policy focused, as was 20% of media coverage overall, compared with nearly double that—36%—at night. When it came to tone, the morning shows again tended to look more like the media overall than did evening newscasts. And that meant the evening newscasts, rather than their morning siblings, offered the more positive picture overall. These evening newscasts were less likely than morning news or the media overall to run stories that were clearly negative (34%), and more likely to run stories that were neutral (41%). They were more typical in the percentage of positive stories (26%). Morning news was identically positive in tone (26%), but almost one-third more negative—fully 44% of their coverage overall. A slightly higher share were neutral (31%). 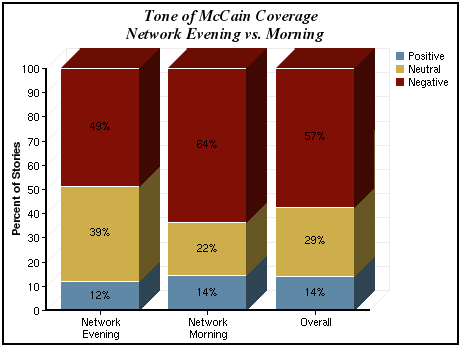 That variance in tone between morning and evening news was most evident in the coverage of John McCain. Fully 63% of the morning news stories about McCain were negative in tone, higher than the press overall (57%). 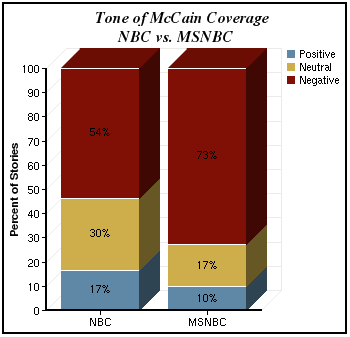 At night, in contrast, McCain’s treatment on the networks was noticeably less negative in tone (49%). Overall, indeed, the nightly newscasts were the least negative medium in the tone of their coverage of McCain of any of those studied. McCain’s coverage on the evening news also tended to be more neutral (39%) than in the morning, (22%) or in the press generally (29%). The same was true for Sarah Palin. She received generally more negative coverage from morning network programs than evening newscasts. In the morning, 39% of Palin stories studied were negative, compared with 30% in the evening. Meanwhile, mornings were less likely to be neutral toward her (30% compared with 47% at night). The only break from this pattern was that morning shows were also more likely to run positive stories about Palin (32% in the morning vs. 23% at night). In all this, the morning shows resembled the media overall (28% positive, 39% negative, 33% neutral). Sarah Palin was also a bigger story in the morning than in the evening. Fully 41% of all stories on the network morning shows focused in significant part (at least 25%) on Palin. That number was 27% in the evening. Joe Biden was also a bigger story in the morning than in the evening. He was a factor in 17% of morning stories, compared with 10% of those at night. 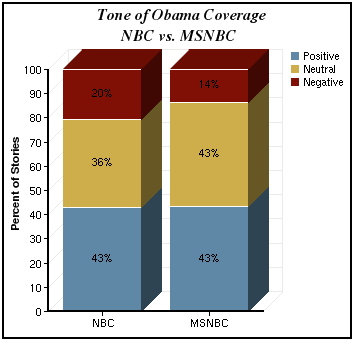 This less negative pattern we found on evening news versus morning also was true of coverage of Obama, though it was somewhat less pronounced. Not only was Obama coverage more negative in the mornings (29% morning shows, vs. 21% evenings), his coverage was also less positive (35% mornings vs. 39% evenings), and less neutral (36% vs. 40% at night). Here again, the morning shows were more similar to the media generally than were nightly news.